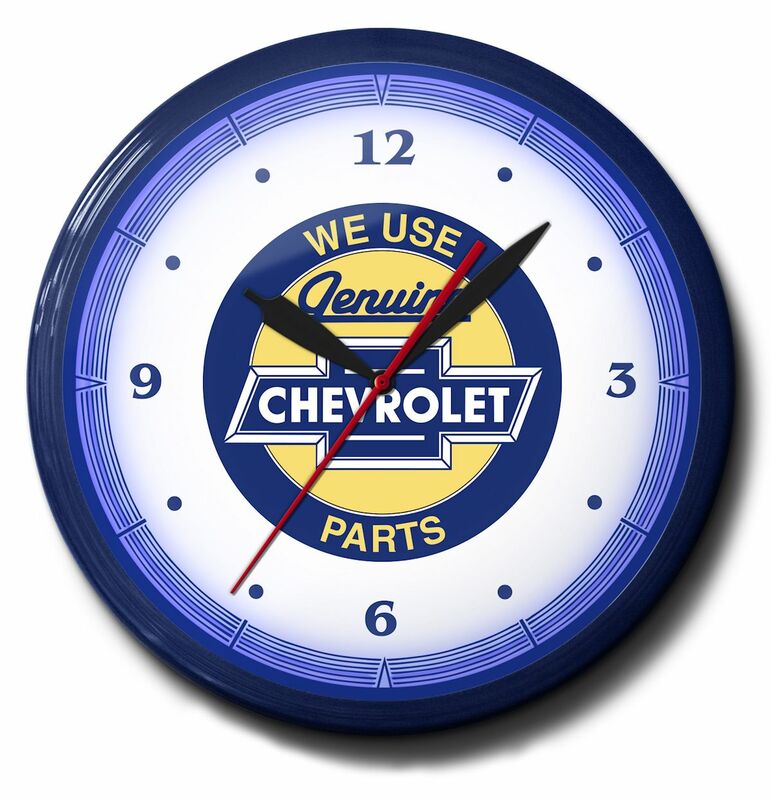 The 20 Inch We Use Genuine Chevrolet Parts Neon Clocks, with Chevy Bow Tie Logos, are high quality neon clocks for sale by The Motor Bookstore at the best prices available, and Free Shipping!. The Vintage Genuine Chevy Parts Neon Clocks, also known as the Chevy Bow Tie and Chevy Red Center, are impeccably designed time pieces. 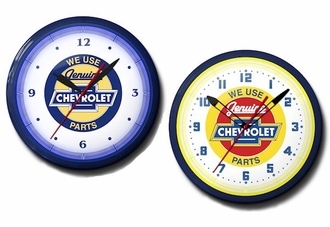 These clocks are not just for car lovers, but Chevy collectors and enthusiasts. Set up with either blue or red options, the 20 inch, 15 pound Chevy Bow Tie is highlighted with a 1/2" long lasting neon tube that will illuminate the Chevrolet logos in a very classy manner. To add to its nostalgic feel, the entire look is accented with decorative blue lines (Chevy Bow Tie) or yellow lines (Chevy Red Center). Made in the USA, the Vintage Genuine Chevy Parts Neon Clock has a hand spun 5 1/4 inch metal bezel. The clock face will always be protected by 5/32 inch crystal glass. The manufacturer takes the building of its neon clocks seriously. From every polished and robust bezel shell and tube support to the distinctive clock face design and the most advanced transformers and lead wire, this manufacturer utilizes only premium grade materials on its neon clocks. They use only the best artists, guaranteeing exceptional craftsmanship. This clock will not only look good wherever you choose to hang it. It will hang in there for over 100,000 hours without a bulb change. That�s roughly 11 years. 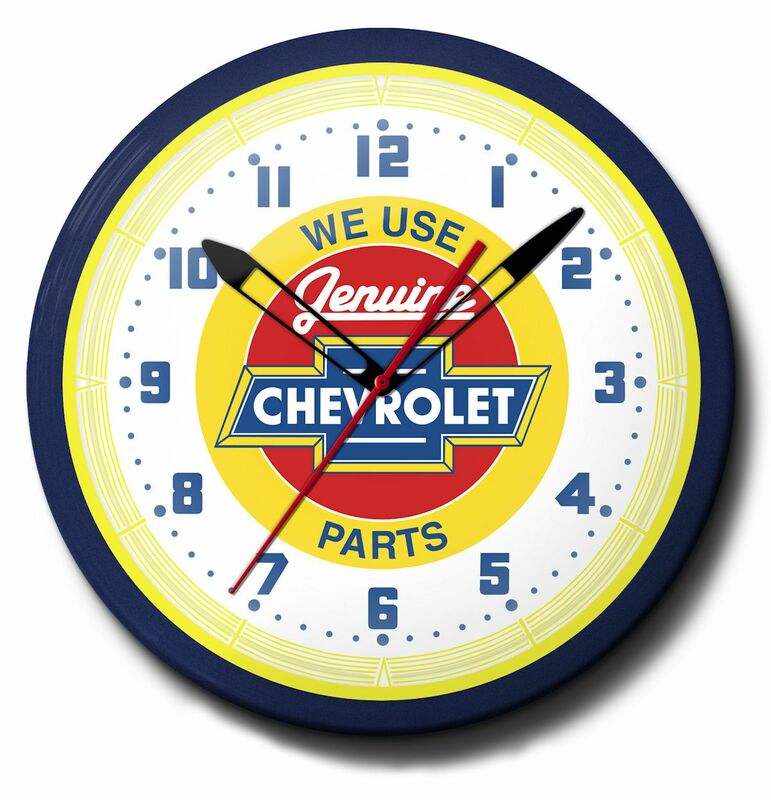 The Vintage Genuine Chevy Parts Neon Clocks are specifically engineered for the car lover. Each one promises to become an attractive addition to any environment, especially your shop, garage or business. The Motor Bookstore is proud to offer these high quality chevy neon clocks, giving everyone that loves a Chevrolet an opportunity to own one of these classic neon clocks. Grab one (or three!) today and give any setting a nostalgic and authentic new look. Refer to the Specifications Tab for the detailed feature specifications of this clock.